Jeffrey Ball, a scholar in residence at Stanford University, showed that historically, countries have made big energy shifts only when confronted with acute fossil fuel crises (oil embargoes, pollution, and wars) or with a perceived energy crisis. France embraced nuclear power in the wake of the 1970s oil shocks and Germany announced plans to shut down its nuclear power plants by 2022 after the Fukushima nuclear catastrophe in 2011. The United States is in the opposite position thanks to domestically produced fossil fuels and it is now exporting significant quantities of natural gas. The U.S. is also experiencing a renaissance in nuclear and solar energy. China has been quite successful in recent years at producing domestic clean energies. A smart U.S. renewable power strategy could benefit from the low-cost solar equipment from China. 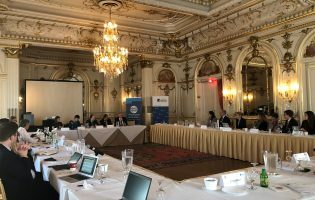 Dale Medearis, from the Northern Virginia Regional Commission (NVRC), described several ongoing strategic projects between the NVRC and regional government agencies in Berlin, Stuttgart, and Copenhagen. These partners were chosen based on similarities in demographics, area, and geography. Initiatives have been launched to learn from best practices in Germany and to improve the understanding of the techniques that are utilized by each region in addressing environmental preservation, land use planning, energy efficiency, transportation management, and similar regional concepts. The second panel focused on the increasingly over-demanded market for basic resources and the consequences of these pressures in politics. Unless the transatlantic community takes the lead in addressing the challenges arising from the unprecedented global demand for land, energy, food, water, and minerals, severe market disruptions are likely to occur, as are increased chances of violent conflict at interstate and local levels. 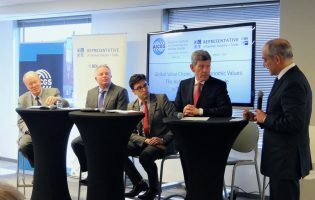 The speakers included Raimund Bleischwitz from the University College London, Tim Boersma, from the Brookings Institution, and Corey Johnson, from the University of North Carolina at Greensboro, who have all previously collaborated on this topic. Since 2000, commodity prices have been both highly volatile and on an upward trajectory due to soaring demand, only briefly interrupted by the financial crisis. Understanding basic commodities such as food, land, and water as part of a resource nexus is crucial in addressing the issues of instability in many of the regions of the world. Some of these resources are used as inputs in producing others or can even substitute for two or more resources. In Syria, the continued stress on water has led farmers to migrate from rural regions to the city. Karachi, Pakistan, is also experiencing significant political unrest as a result of water distribution in the region. The current drought in California is also an example of a scarcity problem. Over the next two decades the international community is likely to see increased levels of stress on the resource market contributing further to the volatility we see around the world. Keynote Discussion, Q&A: A Transatlantic Approach to Energy? The keynote discussion focused on the key differences between German and American policy perspectives on energy. Camilla Bausch, director of the Ecologic Institute Berlin, showed that the “Energiewende” in Germany was a long-term strategy that started well before the Fukushima crisis in 2011. According to Bausch, the “Energiewende” actually started in the 1980s and took a political turn with Fukushima. The German government will shut down the country’s nuclear power plants by 2020 and has set a series of ambitious climate targets for the decades ahead. Ecological interest groups have a strong voice in Germany and have effectively shaped the societal debate about the necessity to shift toward renewable energy and away from nuclear and fossil fuels, steps that are widely supported by the rest of the population. Jim Burkhard, Managing Director at IHS, described how the United States has emerged as a major energy exporter and is diversifying its global supply. The U.S. growth in oil production since 2008 is greater than any OPEC country except for Saudi Arabia; North Dakota alone produces more than some OPEC countries. The U.S. is the biggest exporter of refined products in the world and its gas market is now more diversified. Contrary to Germany, there is a lack of framework to deal in a coordinated fashion with greenhouse emissions. 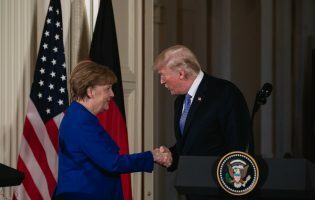 The U.S. and Germany can learn from each other, especially in the field of energy efficiency and in the development of renewable technologies. The final panel addressed the relationship between energy and statecraft. Andrew Holland, a Senior Fellow for Energy and Climate at the American Security Project, provided an overview of different periods of U.S. history where there was either a perceived abundance or scarcity of energy. He noted that we are living not just in a shale revolution but rather an energy revolution and, additionally, this is not just a U.S. energy revolution but rather a global energy revolution. He described energy security as the ability to get the resources that are needed to survive. The traditional policy of the United States has long been to promote a global free market for energy, an approach that is unlikely to change in the current period of energy abundance. Touching on European energy security, Severin Fischer, an associate at the German Institute for International and Security Affairs, focused on the historical energy relationship between Russia and Germany (and the EU more broadly) and the implications of this relationship in regard to the crisis in Ukraine. Many observers have noted that the country imports nearly a third of its gas from Russia, but few in Germany are overly concerned with the stability of this supply. While there is a renewed focus on energy security in Europe, Germany has few means to shape European let alone global energy markets especially after the Europeanization and liberalization that began around 1998.
thus face very different energy security issues. Other than the potential for U.S. exports of oil and LNG to Europe, a common U.S.-German approach to energy is unlikely. Please contact Kimberly Frank at kfrank@aicgs.org with any questions. Support for this event was provided by the Daimler-Fonds im Stifterverband für die Deutsche Wissenschaft.